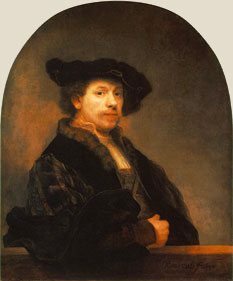 Rembrandt van Rijn was born in 1606 in the prosperous Dutch city of Leiden. His father owned a mill and so the family was part of the prosperous middle class, the property owning class of the new Dutch Republic. His skill as a draughtsman soon led him to the big city of Amsterdam where any artist who was good could earn a very substantial income. Rembrandt was an immediate success. His portraits sold for high prices almost immediately and he worked very hard. In one year, 1632, he painted 50 paintings which earned him a huge income. For almost forty years, his paintings were valued and sold for high prices. When he died in 1669 he was one of the most famous artists of all time. (July 15) Rembrandt born in Leyden. Father a successful miller. Rembrandt begins studying at Latin School. Getting good basic classical education. As a painter knows BOTH classical and biblical stories. Rembrandt enters the University. Leyden University. Rembrandt later in year leaves university. Wants to study painting. Rembrandt now painting in Leyden. Still teenager. Citizen of Leyden says: miller's son the painter much praised. Rembrandt already well known. successful painter at 23. Rembrandt in Amsterdam. living with art dealer Van Ulenburgh. Rembrandt marries beautiful Saskia. (cousin of his landlord Van Ulenburgh). They have 4 children; only Titus survives. Rembrandt buys huge expensive house in Breestraat. costs 13,000 guilders. spending enormous amounts of money. Birth and baptism of Titus. Saskia never recovers. In June: Saskia dies after long illness. Geertje Dircx joins household as Titus' nurse. Becomes Rembrandt's mistress. Geertje makes will: leaves everything to Titus. Hendrickje Stoffels joins household, replaces Geertje, she sues. Court does not force R to marry her but to pay annual alimony. Rembrandt withdraws from painting. a dark year. Rembrandt retaliates, lawyers collect gossip. Gets Geertje committed to reformatory on basis of a "morals" charge. Rembrandt's worst act. later knows it. Bad economic times in Holland: Rembrandt's economy falls apart. Court orders sale of all Rembrandt collection, (not same a bankruptcy). Rembrandt house sold at auction. Almost everything goes on sale. Hendrikje and Titus form company to trade art (Rembrandt's). to protect him from creditors. For rest of life he works as employee of their company.